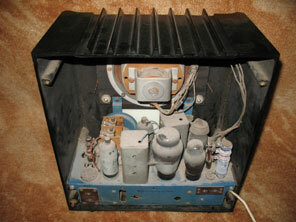 Shown above is the AD94 receiver. 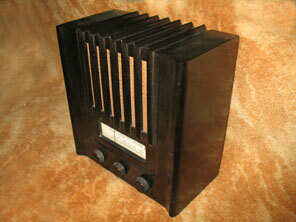 This was the first receiver from Murphy to utilise a Bakelite cabinet. This cabinet is of wholly black bakelite, and was designed by Eden Minns. The receiver formed the basis of the design for the Civilian Wartime Receiver which was to be released a couple of years later. The chassis is held into the cabinet by four screws, but thoughtful design means that all are accessed from the rear of the cabinet rather than the underside, which obviates the need to upend the cabinet during servicing. The AD94 cost £9.10.0 when released, and Purchase Tax would have been payable on top of this price from October 1940 at the initial rate of an additional 33 1/3%. 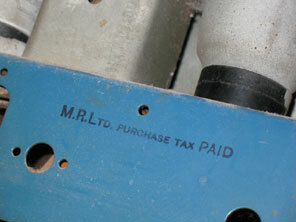 In this particular receiver it can be seen that Murphy has in fact stamped the chassis to confirm that Purchase Tax has been paid, see picture below. Valve line-up was TH233, VP133, HL133DD, PEN383, U403. No new models were introduced in 1941 or 1942, so next receiver described is 1943.